Bohus sweater? What Bohus sweater? I’ve been spinning for a new project. It couldn’t be helped. The moment I saw Jared’s sweater (Fall 2007 Interweave Knits) and dyed the Mollusc Wensleydale, I knew they were a match. Won’t the garter of the yoke look like wet cobblestones in this handspun yarn? approx. 550 yards/ 11.7 oz. This is heavy, dense, drapey, shiny stuff. The yarn I’m using for the body is Classic Elite ’03 Tweed in color # 5975. People, there is acrylic in this yarn. You wouldn’t know it, though. I was going to use the called-for Classic Elite Skye Tweed I have in charcoal, but after reading Aran Knitting, I am OBSESSED with Na Craga and will die if I don’t have a charcoal tweed version for my very own self. And really, the Classic Elite ’03, of the ’03 is to be believed, has been in my stash a good long time! I’ll woman-ify Cobblestone a wee bit, adding waist shaping and not much else. As for the waist shaping, I could narrow and widen that side garter band so that it looks like an hourglass, or I could do the shaping on either side of the garter band. I think that the latter might be more interesting. I is *this close* to being finished. It’s tomorrow at 2pm EST. 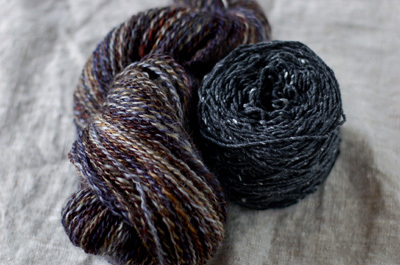 There’ll be lots of sock yarns and spinning fibers, and Sarah from Maisy Day Handspun send some big fat cushty skeins of thick and thin Merino and some gorgeous fine and slick two ply mohair. So glad you are knitting the Cobblestone for yourself. I look forward to seeing your progress. I love this sweater and want it for myself also. Can’t wait to see how your handspun knits up either! The Cobblestone has me all a-twitter, so I can’t wait to see yours. 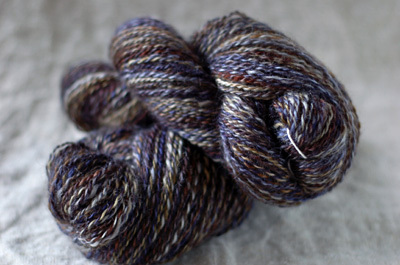 But I’m most excited about the shop update–I wanna see the new sock yarn! Oh, I can’t wait to see your womanized Cobblestone! I’m making a womanized version for myself right now and decided to do the waist shaping in the garter band, so I’ll be really interested to see what it looks like to do it the other way if that’s what you wind up doing. That yarn is going to look gorgeous in the garter yoke! Can’t wait to see the finished Bohus, either! You choose the most beautiful sweaters. Jared’s Sweater will be gorgeous with your handspun in the yoke. Wow, that Na Craga is beautiful, totally understand the obsession. I can’t wait to see your finished Bohus I’m so infatuated with the colors on the top portion. That handspun is going to be gorgeous in the yoke. I just finished my Cobblestone today. Love it. I didn’t add any shaping, but then I’m not a very curvy person. I was thinking it would be neat to extend the side garter bands through the sleeves with the increases coming out the sides if the band. Maybe next time. 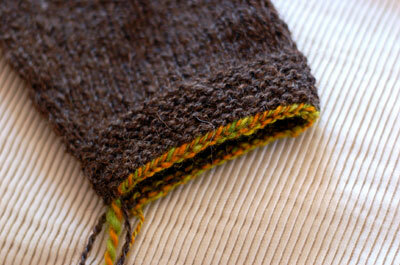 The cuff on the Bohus is wonderful, I love those strong contrasts! oh it all looks soooo nice. love the handspun. and it is a lovely idea to modify the cobblestone. i am knitting your pirate cap right now for my friend who is a pirate with homemade tattoos. hope there will be no cap curse. it is a fun knit. the children in 4th grade are obsessed with pirates and i even comtemplate making one for myself just to show off and to have something to cover my ears with when the noise becomes too heavy. I love that handspun. It’ll look lovely knit up into the Cobblestone. I can’t wait to see how you navigate the side shaping. I wore my Mushroom Wristers for the first time (aside from the modeling) last night. They do a great job of keeping the chill off and still allowing me to knit. can’t wait to see your cobblestone. your yarn is gorgeous! have to go check out the shop even though the yarn budget is at $0 right now. i can add some to my wish list. is it too early to make a christmas list? That’ll be a sweet combination and very cobblestoney. Oh. my. gosh. that handspun is in the most beautiful colors. Sigh. I love the idea of a cobblestone sweater. I will have to file that in the old brain for a great project to knit with handspun.